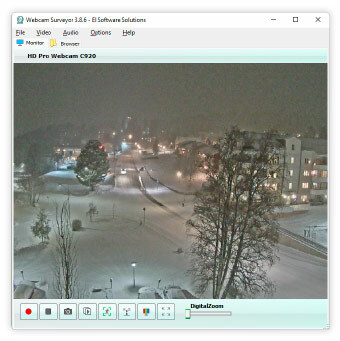 Webcam Surveyor is a simple and functional application designed for video capture and surveillance. With this software you can quickly and easily broadcast live media streams over network, record videos, take snapshots and monitor all motion activity. The motion detector allows turning your computer into a complete surveillance system and logging all events in your absence. If motion is detected, the application will execute predefined actions: record video, send an email alert, upload images to FTP site, run other application, play alert sound, etc. With advanced motion capture feature you can save time and disk space by recording only the frames with the motion. Broadcasting - By pressing one button you can easily stream a webcam video over Internet or local network. It allows you to view what is happening in your home or office in real time. Video Capture - easily record a webcam video. Continuous 24/7 recording - view a resulting video during recording. Capture Image Sequences - With this feature you can take shots from a webcam at fixed time intervals, in the range from one second to tens of hours. The application can shoot a sequence of images directly into a video file. This makes it easy to create a time-lapse video without any additional steps. Motion Detection - monitor your office or home and record all motion activity. Motion Capture - record only when motion is detected. Stealth mode - allows you to use the camera in the background. You can hide the application on computer and manage it by hot keys. It can be run on Windows startup, and still be invisible. Ease of Use and Compatibility. 700 MHz CPU IBM PC compatible computer or higher, (Dual core PC for HD capture). 40 MB of free memory (RAM).